I have recently received a permanent evaluation unit of the Lenovo ThinkCentre M90z to both put through its paces and to consider ways it can be used in the K-12 arena. I am part of a second round of evaluators, all of whom have a different career, who get to use this new machine and blog about it. The ThinkCentre M90z is a very cool machine! The first thing that I tried out was its touchscreen, which Lenovo calls the "multitouch panel". Of course, it comes with the requisite keyboard and mouse, but you can pan and zoom and rotate and right-click just using your fingers on the screen! The intuitive nature of controlling by touching is a feature we all have become accustomed to with our small tablets, but having that ability on this desktop's big screen is awesome! The ThinkCenter M90z also comes with bundled software that allows you to control some of the hardware functions via touch. Now some geek speak...the ThinkCentre M90z is a one piece, all-in-one desktop with a 23" widescreen with full 1080p HD resolution. It has an Intel Core i5 processor and 4 gigabytes of RAM and runs Windows 7 beautifully! The M90z has a Web cam and mic, and also has some additional unique features. It has a DisplayPort connector, like some laptops do, to allow you to hook it up to another monitor or an LCD projector for whole-class viewing of the info on the ThinkCentre M90z computer with an optional cable. However, the computer also comes with a VGA-in port, which means you can hook up your laptop or iPad to the desktop and use the ThinkCentre M90z as a large-screen monitor, too! The model I received has six USB ports, so, with the purchase of an external USB 802.11x wireless adapter, you can put this one-piece unit anywhere you can find a single electric outlet! Of course, it has an Ethernet port, too, but it is nice to think you could place this computer in a public place for access by students or staff! If you want to read more about the specs and watch it in action, take a look at this page. And the link to the user manual can be found here. There will be the announcement of a promotion soon, as there was in December for the first round of evaluators. I am not yet sure what the "prize" might be for the promotion I am going to sponsor, but, suffice it to say, if you take the time to read about the Lenovo ThinkCentre M90z and think of creative ways it can be used in the K-12 classroom or school, you will be ready for any promotion I launch! I recently attended a workshop covering the use of the iPad for administrators. I went to support my administrators as they learned everything from unboxing to syncing to installing apps. As I was sitting there, I realized what was needed, to move the "one-to-one with tablets" initiative ahead, was a workshop which covered the reasons to use these devices to support teaching and learning, included an overview of successful practices already in place, and showcased lots and lots of apps in all content areas at all grade levels. 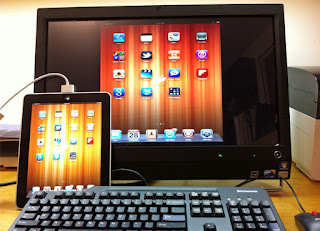 I am in the process of developing such a presentation (The iPad as ePad) and it could not be more fun to put together! There is also a Google form on that page to add your favorite "iPad in education" list of apps or blog or lesson plan or ideas page. Please take the time to share if you know of a great resource!